Come 2012, Star Wars Galaxies will no longer exist. Sony Online Entertainment and LucasArts have announced that Star Wars Galaxies will be officially shut down at the end of 2011. This marks the end of the game's tumultuous 8 year existence. On September 15, 2011, both the Star Wars Galaxies MMO and trading card game will be removed from all physical and online retailers. Billing will end on October 15, with refunds for those that have paid for subscriptions beyond that date. For all subscribers in good standing by September 15, Star Wars Galaxies will be free to play until the service shuts down for good on December 15, 2011. Star Wars Galaxies launched in summer 2003 to much anticipation as the very first MMO set in the Star Wars universe. 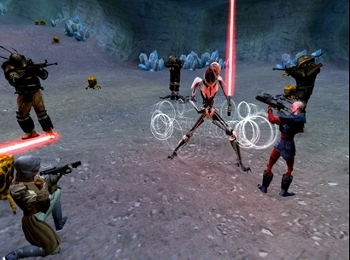 The game faced a gargantuan amount of controversy two years later in November 2005 when an update called the "New Game Enhancements" majorly simplified Star Wars Galaxies' gameplay and class mechanics (read about it here). The NGE was largely considered a serious blunder, and the game may never have recovered. SOE is planning a "galaxy-ending event" for Star Wars Galaxies that it says will be partially written by fans. Further details will arrive at a later date. As an extra fan appreciation bonus, Star Wars Galaxies subscribers in good standing will also be able to play other SOE MMOs such as Everquest and DC Universe Online for free from October 15 until the end of 2011. Star Wars and MMO fans can take solace in the fact that BioWare's Star Wars: The Old Republic will presumably arrive to take Star Wars Galaxies' place sometime in the future.